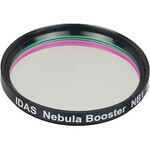 IDAS Filter Nebula Booster NB1 48mm 2"
IDAS Nebula Filter LPS-D2 2"
IDAS Nebula Filter LPS-D1 1.25"
IDAS Nebula Filter LPS-V4 1.25"
IGAD (Ion-Gun Assist Deposition): This coating technology was originally developed for the optical communications field where long-term stability (>25 years) over harsh field conditions is required. 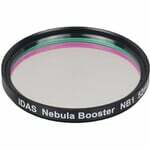 IDAS is the first manufacturer to apply this technology to astronomical filters. 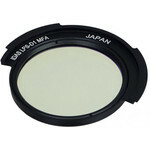 This results in superior filters with robust coatings and long-term spectral stability even under temperature and humidity extremes. 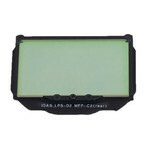 This stability is especially important for bandpass curves with steep slopes such as H-alpha, LPS filters, and other narrow bandpass filters. 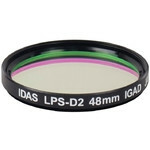 IGAD filters virtually eliminate bandpass shifts from the +/-3 or 4nm typical of standard coating filters. 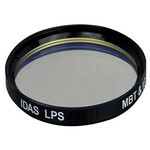 MBT (Multi Band-pass Technology): This is technology originally developed for biomedical microscopes, but improved by IDAS by combining it the IGAD hard-coating technology described above. 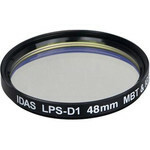 The excellent filter responses possible with this technology allows IDAS to create very complicated filters for astronomical use such as the unique LPS filter. 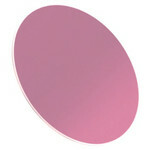 UFP (Ultra Fine Polish) Finishing: IDAS filters are polished twice as long as is typical for optical glass. 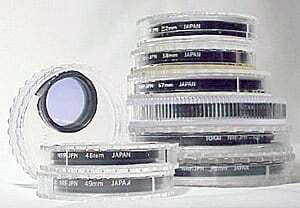 In combination with the use of high-quality substrate glass, no scratches, bubbles, or other defects are visible even under microscopic inspection.